I've been procrastinating sharing the house with you. It's not you, it's me. It turned out renovations were really stressful and the last thing I had the mental capacity to do at the time was write about them. But they say distance brings clarity, right? So here we go. B and I closed on our house in July. Despite the INSANE pressures I feel from the interwebs to DIY everything (DIY guilt as a future post? ), it just wasn't feasible for us at this time in our lives to complete the house renovations ourselves for myriad reasons. So we hired out. And it took forever. But that's yet another post or maybe a book. For now, let's start at the entry since it's freaking logical. It's Cole & Son 95/6034 Hicks' Grand. Classic, a mid-century nod, slightly updated. But it had a whopping retail price of $185 per roll. Plus overseas shipping (the Brits make the best wallpaper.) I would need JUST over one roll so that meant buying two. 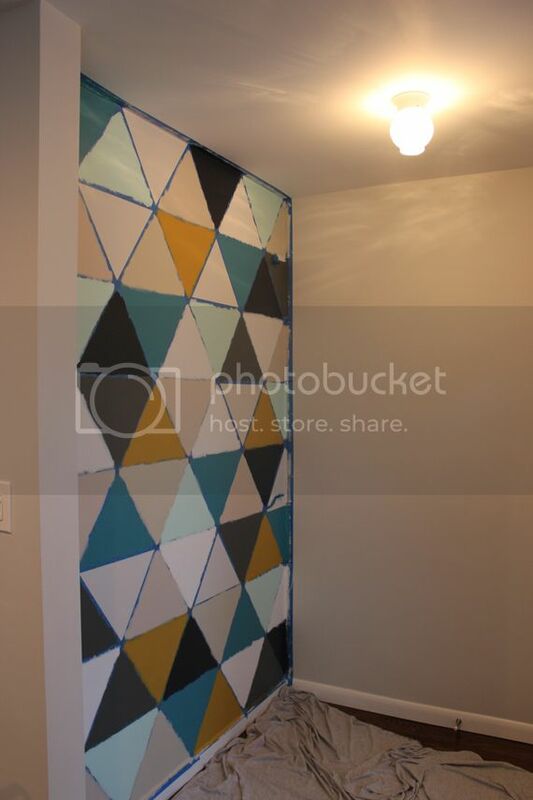 Once I've dropped that many hundos on wallpaper, I would want to pay to have it professionally installed, which was going to run another $200+. Even with a meager designer discount on the paper itself, the total job was still clocking in well over $500, which was doubling our budget for this area. 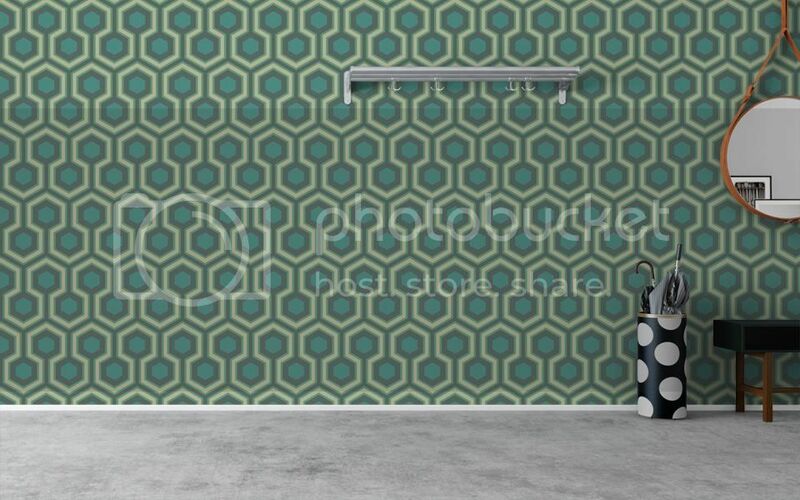 Believe me, I tried to find a less expensive wallpaper I liked to no avail. We decided it would be economical and kind of fun to use the leftover paint to create the design using all the colors in our palette, but we thought it needed a bit more pop so we added in the gold/mustard color 10 above that went with our living room rug and throw pillows. 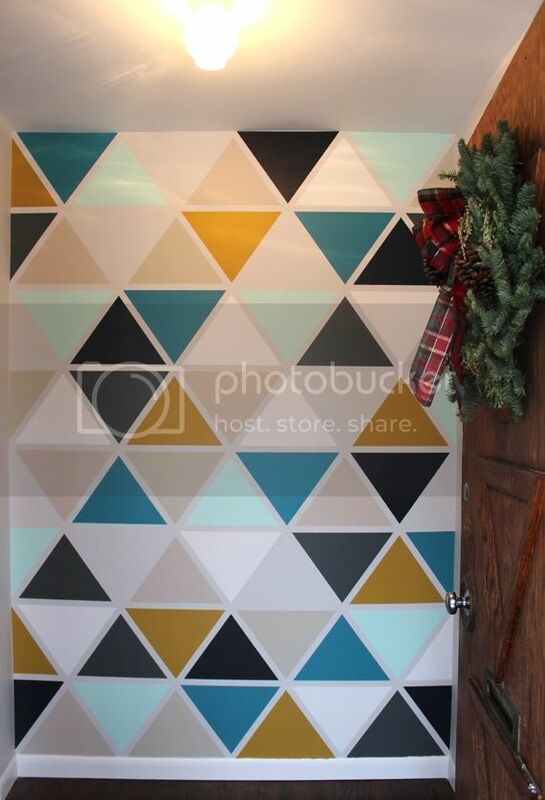 Since the door had the triangle details, we decided to play off of that. Luckily I had a partner in crime on this that took the time to Photoshop a mock-up. The pattern is random/by eye. Then B taped off the border and marked out the measurements for each incremental piece of border tape. 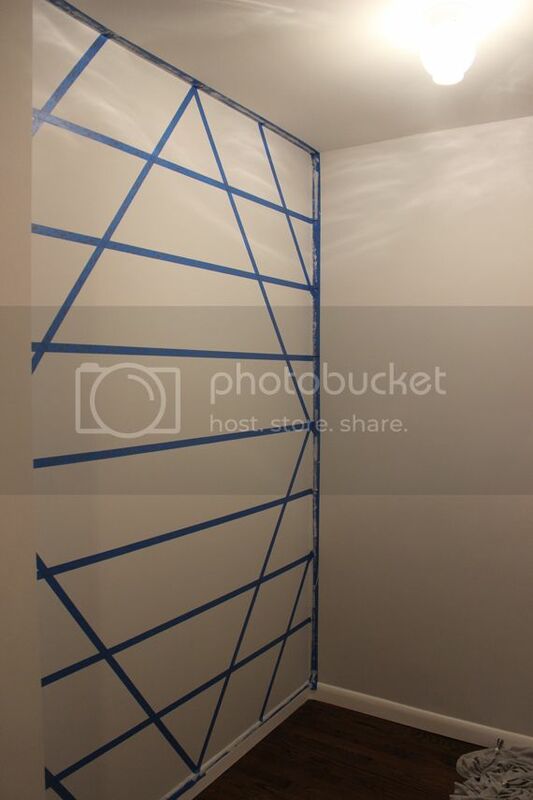 Then we taped off the lines! 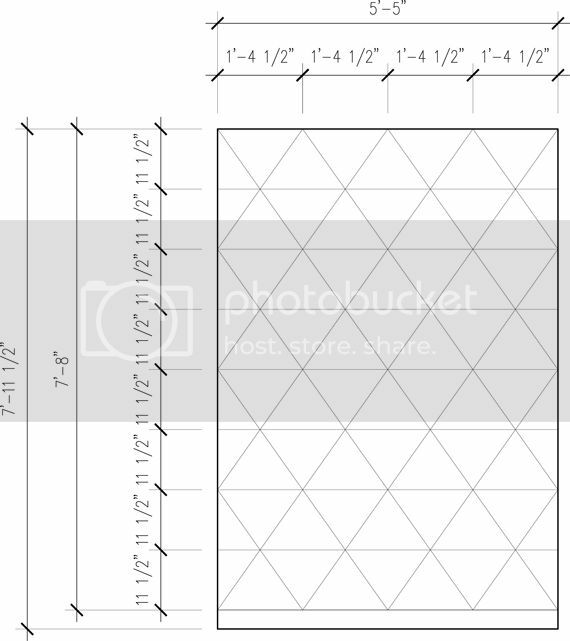 Line the center of your tape with your measurement marks. 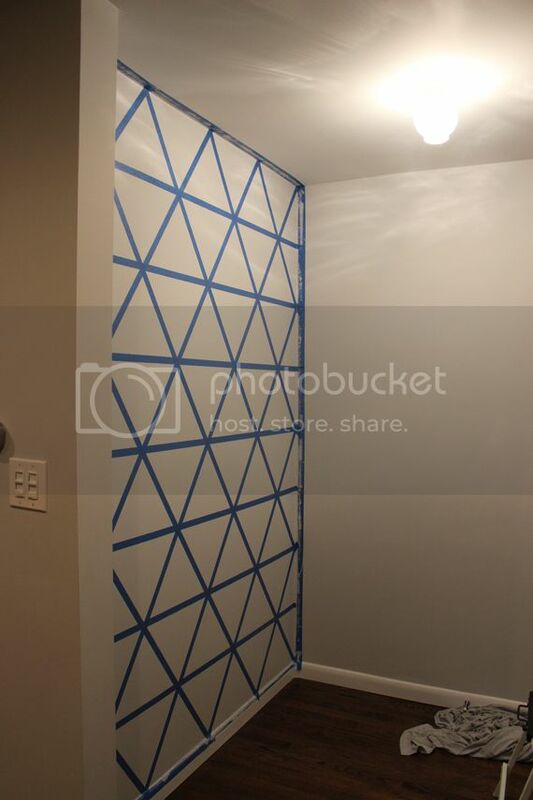 B did the horizontal taping himself, but the diagonals were a two-person job in order to get them straight as can be and intersecting in the right spots. We used 3M ScotchBlue with Edge-Lock. Then we went over all the tape with a credit card to ensure we got the crispest lines. 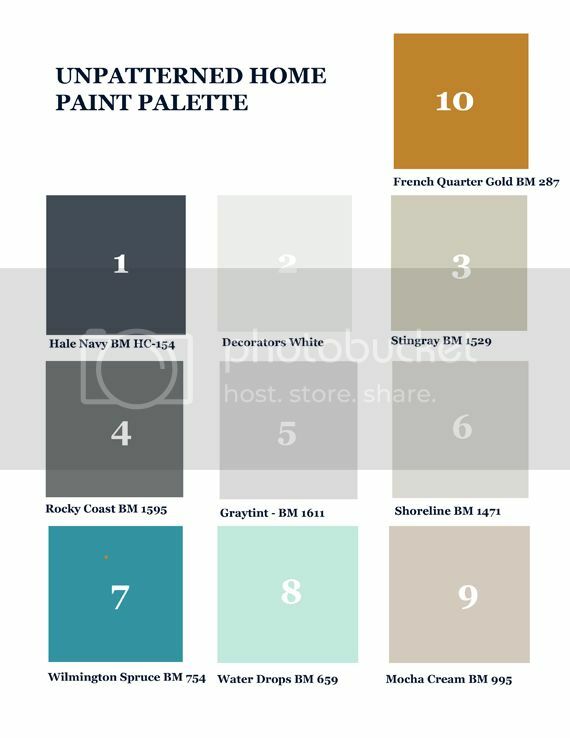 We assigned each of the paint colors a number as you can see in the diagram above. 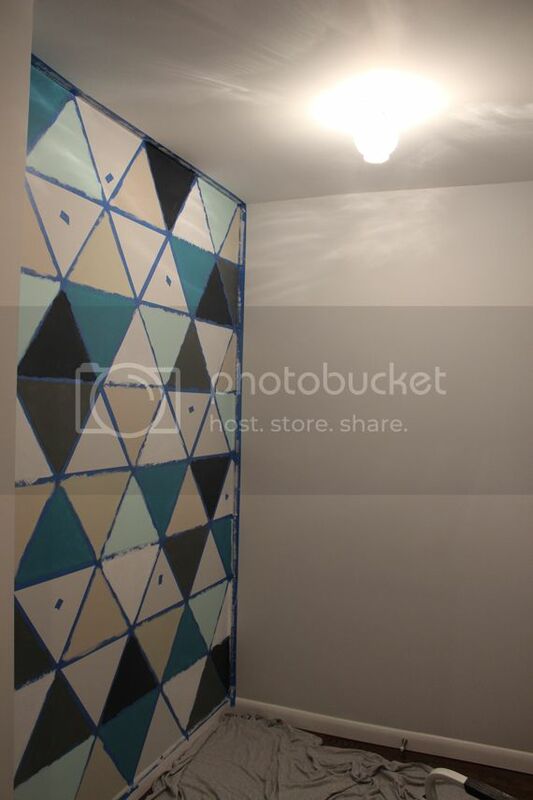 Then we ever-so-lightly wrote them in pencil on each triangle and added a piece of blue tape to each of the Graytint triangles that didn't need to be painted. We started with brushes but the brush strokes were too noticeable, particularly on the dark colors. So we switched to a 4" foam roller for the second coat, which required a bit more precision, but provided a much smoother finish. 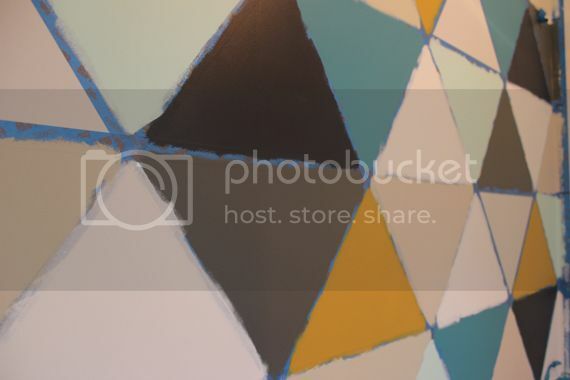 Each triangle got 2 coats of its color. It admittedly looked a little scary once we were all done painting, which happened over a series of days. The tape was covered in paint and we were worried about how it would peel off. The electric blue lines don't provide the best visual. BOOM! After the tape was all peeled off (holy paint chip mess!) I was definitely squealing with delight. The mock-up did not fail us! I may have hugged the wall and asked it to marry me. 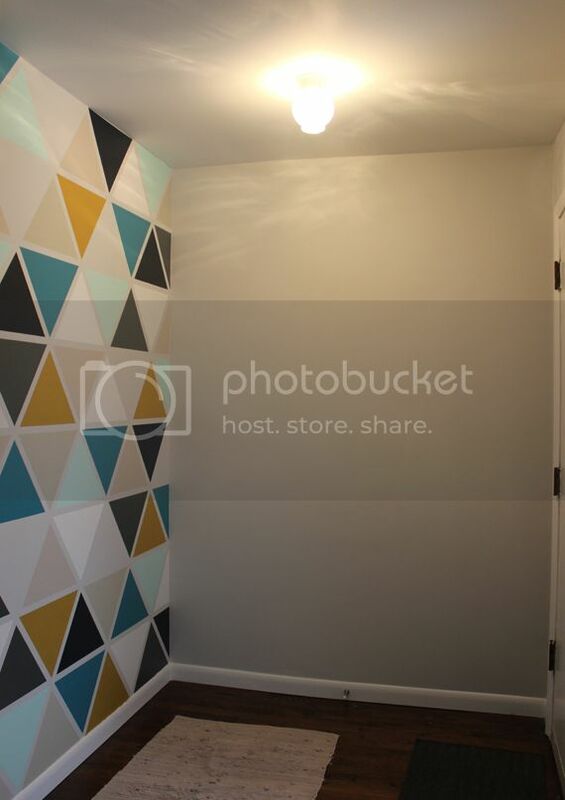 I love that is it is allllmost wallpaper like, the triangles play off the door and the colors are a life-size paint palette mixed with neutrals and pops of color. 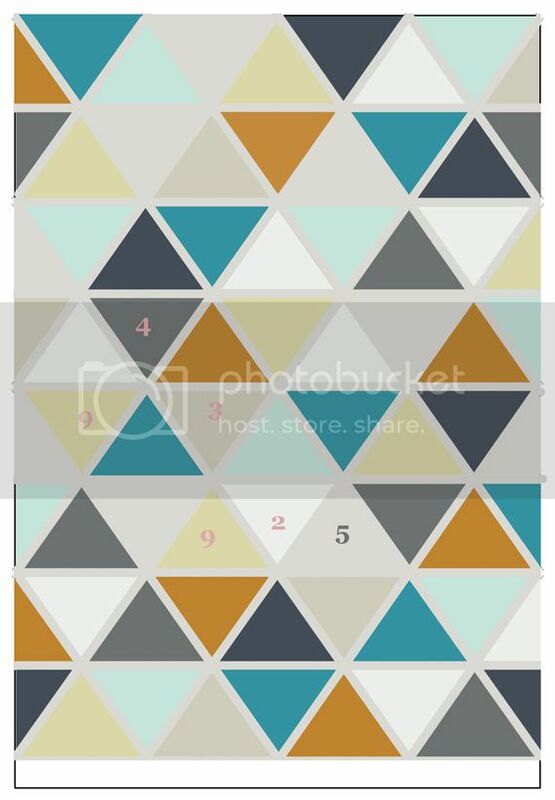 Plus the randomness of the pattern really works for me at this scale and adds just enough extra interest rather than a repeat. The Edge-lock tape really did its job. Only a few areas have the slightest sign of saturation, but they are hardly noticeable. The best part is, it cost under $100 to create. 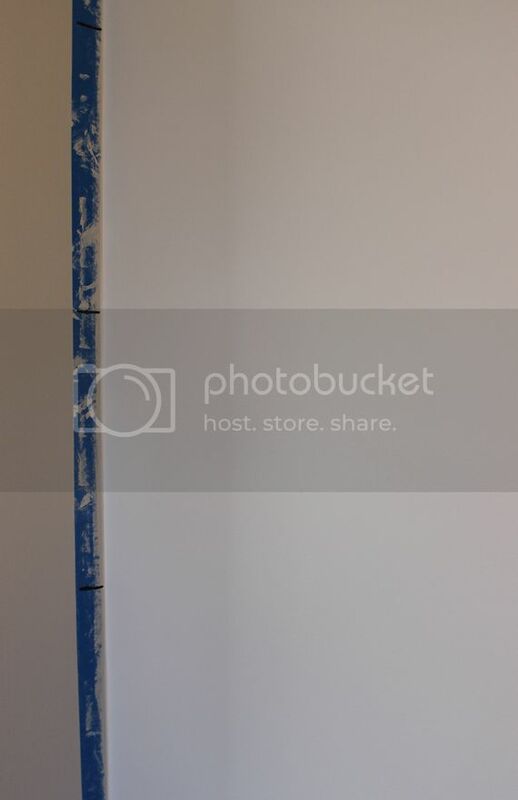 Since we already had most of the paint, it was just a quart of the gold paint, the blue tape and some painting supplies. Here's a glimpse of it from sitting on the living room sofa. I can't wait to have that door open in the summer. 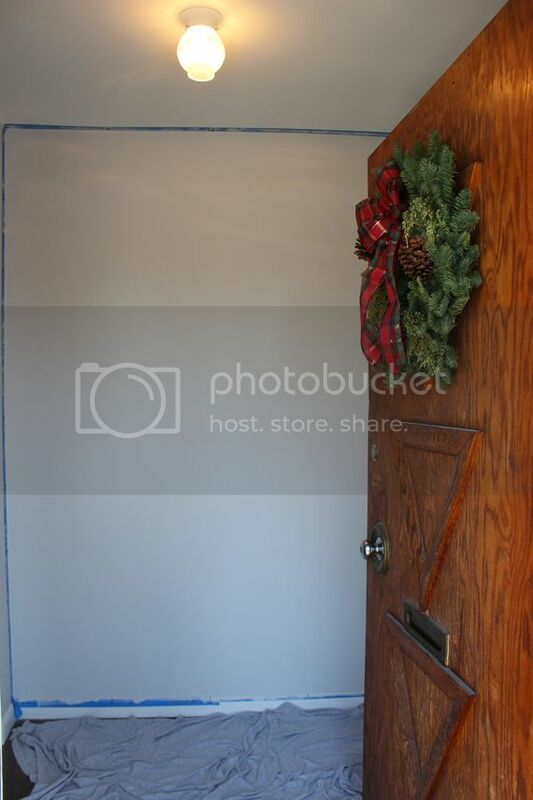 And to put some life back into that gorgeous door from the outside! And replace the knob with something more appropriate to match the original escutcheon! 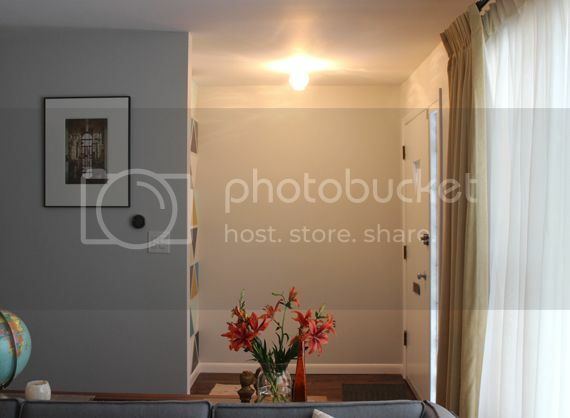 And to just make the entry nook more functional with a table or shelf, a mirror perhaps, a new light, maybe some hooks, and a single rug that actually works. I don't know, what do you think it needs? Progress is slow, but satisfying.